The Salter Labs 8900 Small Volume Jet Nebulizer is a versatile, high performance jet nebulizer which delivers reliable and cost effective aerosol therapy. Ideally suited for hospital or home therapy. Unique design allows 3cc medication delivery in less than 10 minutes, even when held at an angle. Works great in ventilator circuits. Easily connects to adult or pediatric masks and the new special Salter I-Guard™ Aerosol Masks. 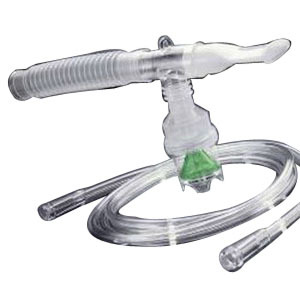 Nebulizes 3cc in less than 10 minutes in horizontal or vertical position. Larger surface area provided by unique convex cone design. One-eighth turn screw on cap.